Japanese Management in Evolution illustrates the significant changes that have been taking place in Japanese business by focusing on "emerging industries" in the relatively neglected service and "creative" sectors as well as other key industries, and to put those changes in historical perspective by providing an overview of business development since World War II. 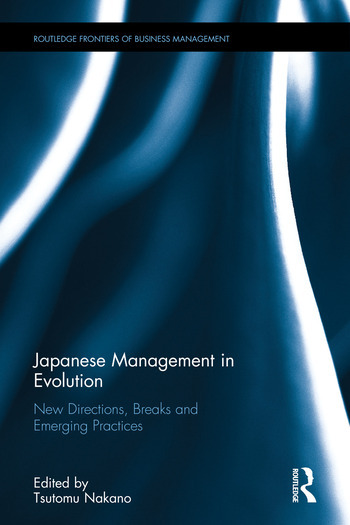 By employing state-of-the-art research techniques and unconventional innovative approaches in analysing Japanese management – including network and discourse analysis, ethnographic explorations, and more – the book reveals historical developments and in-depth analyses of established and emerging composition of sectors and industries where cultural capital matters. Throughout the book, the common theme conveyed to readers is a consistently strong message that the change is ongoing and the evolution of management style is real in the Japanese context. The book would be of great interest to researchers, academics and practitioners in fields of global management, international management, and Asian capitalism. Tsutomu Nakano is Professor of Organization and Strategy at the Graduate School of International Management, Aoyama Gakuin University. He received his PhD in sociology from Columbia University and is on the external faculty of the Center on Organizational Innovation. His research interests include valuation studies, clusters, organizations and networks, and social design. In 2015-16, he took visiting positions at Copenhagen Business School, ENS Cachan, and MPIfG.